The UK daily papers are full of outrage that Northern Ireland’s Democratic Unionist Party (DUP) blocked proposals yesterday that would have moved Northern Ireland’s customs border to the Irish Sea. The 10 DUP MPs are currently propping up Theresa May’s minority Conservative government on a confidence and supply basis. Theresa May’s premiership could not continue without their support. Now the DUP saying ‘NO’ should have come as no surprise to politicians or journalists. Last week I wrote this. But something about yesterday’s events simply doesn’t add up. And this morning the DUP said the Tories ‘had no misunderstanding’ about the text of a UK-EU agreement on the Irish border. The Conservative Party was aware of the DUP’s opinion, said Jim Shannon – one of the 10 DUP MPs on whose support the UK government relies on to stay in power. They say an elephant never forgets. Neither does the DUP. Just over 32 years ago – on Saturday 23 November 1985 – I was one of a number of freelance journalists retained by a national newspaper for the day to count the number attending an enormous Unionist Rally led by Ian Paisley of the DUP against the Anglo-Irish Agreement, which for the first time gave the Irish government a consultative role in matters related to security, legal affairs, politics, and cross-border co-operation. We reckoned that over 100,000 people were at Belfast City Hall to protest against the Anglo-Irish Agreement (AIA). Their slogan – ‘Ulster Says No’. Last Saturday thousands of members of the Apprentice Boys marched through Derry to commemorate the 17th century siege of the city. In keeping with tradition, the ceremony ended with the burning of an effigy of Lieutenant-Colonel Robert Lundy – the man known as Lundy the Traitor. The marchers commemorate an event known as the Shutting of the Gates – when 13 apprentices locked the walled city’s gates against the approaching army of the Catholic King James II in December 1688. Robert Lundy earned his reputation for treachery among unionists when he offered to surrender to the Jacobite army five months later. More than 300 years on from the siege, his name is still associated with those viewed as having betrayed the unionist cause. Calling someone a ‘Lundy’ is one of the worst insults that can be hurled at a unionist politician. So Theresa May, Donald Tusk and Leo Varadkar should certainly have been prepared for the DUP reaction. Then again, it is the Christmas Pantomime season. Yesterday a charity single was released featuring ‘C list celebrities’, including the former DUP First Minister. 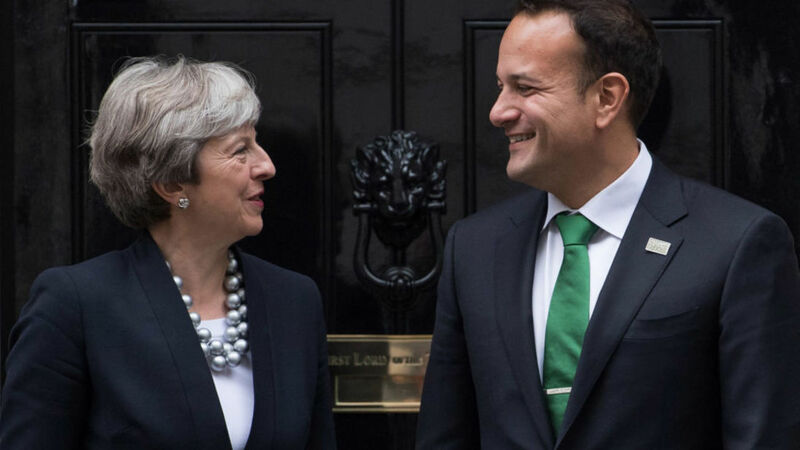 Ireland’s Prime Minister Leo Varadkar said he was “surprised and disappointed” that an anticipated deal on Brexit was not reached yesterday and that Ireland could not go into a second phase of Brexit talks without “firm guarantees that there will not be a hard border in Ireland”. The Taoiseach told a press conference in Dublin that earlier on Monday, he had been in touch with EU Commission President Jean-Claude Juncker and EU Council President Donald Tusk and confirmed to both Ireland’s agreement on the form of words about the Irish border. But the deal didn’t go ahead. It broke down when the DUP publicly challenged Theresa May by holding a lunchtime press conference saying her party would “not accept any form of regulatory divergence” that separates Northern Ireland from the rest of the UK. Classy as your North American namesake there, Donald. Bob Geldof wrote the song I Don’t Like Mondays after the Cleveland Elementary School shooting on January 29, 1979, in San Diego, California. The principal and a custodian were killed; eight children and a police officer were injured. A 16-year-old girl, Brenda Spencer, who lived in a house across the street from the school, was convicted of the shootings. She is still in prison. More cynical observers may share the view that Jean-Claude Juncker’s praise of Theresa May as a tough negotiator at his joint press conference with May was all for the optics. Was the deal designed to fail? ‘This is not a negotiation. It is a drive-by shooting.’ Why do the wise words of Sir Fred Goodwin keep coming into my head? It was Vladmir Lenin who said that ‘A lie told often enough becomes the truth’. The Brexiteers may have been thinking of this when they photo shopped a London bus, with the slogan that voting to Leave would return £350m a week to the National Health Service. On Sunday Tony Blair announced that he is spearheading a campaign for a new EU Referendum, on the basis that we were lied to about the cost of Brexit. Not only have Brexiteers been forced to admit the lie, they have also been forced to concede that the UK will pay between €50-70bn in a divorce bill. There is only one way for Theresa May to overcome the DUP’s objections: and that is regulatory alignment between the EU and the whole of the UK. Or she could simply admit that Blair is right, the UK needs a new referendum. This time, with the facts up front and unredacted. For Theresa May to trust the Democratic Unionist Party to follow through on any ‘deal’ shows the blind faith of a fool expecting a leopard to change its spots. Continuing to rely on the support of a party who have shown they cannot be trusted makes her look like a turkey voting for Christmas.